크라비, 태국의 스테이오버 호스텔 | 호스텔월드에서 예약하세요. Experience a Stayover and you will never want to leave. 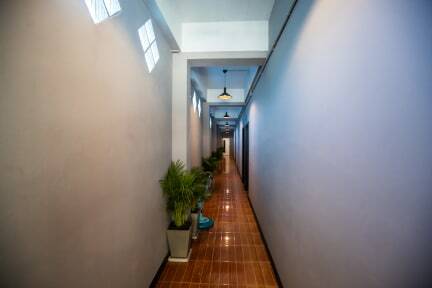 You are welcome to one of Ao Nang’s stylish hostel. 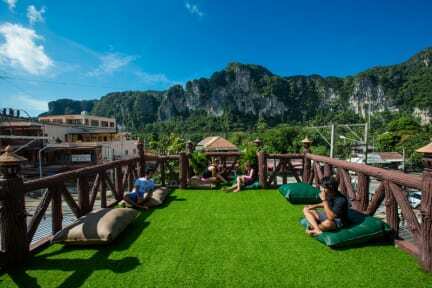 Stayover is a cozy and friendly hostel with a trendy design providing you with great service and hospitality to make your stay in Ao Nang a pleasant one. The hostel is ideally located only 1.4 km from the beach and nightlife also close to a variety of restaurants. On the rooftop, Stayover has a spacious outdoor area with picturesque views of the mountains as you relax and mingle with fellow backpackers. The central location is accessed by the main road going through Ao Nang. All rooms have lockers available for your safety and each floor has shared toilets and showers, as well as free Wi-Fi in the entire hostel. Motorbike hire for your stay is also easily arranged which are parked on site. Erleben Sie einen Aufenthalt dem Sie niemal wieder verlassen wollen. Sie sind herzlich willkommen in einem der stilvollesten Hostels von Ao Nang. Stayover ist ein gemütliche und freundliche Hostel mit einem trendigen Design, das Ihnen einen tollen Service und Gastfreundschaft bietet, um Ihren Aufenthalt in Ao Nang angenehm zu gestalten. Die Hostel ist ideal gelegen, nur 1.4 km vom Strand und Nachtleben entfernt, eine Vielzahl von Restaurants sind auch in der Nähe.